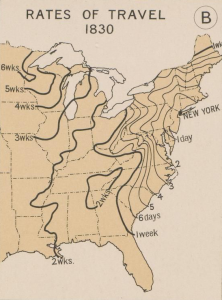 In fall 2014, Prof. Jan Knoedler (Economics) showed GIS Specialist Janine Glathar a series of historic maps included in one of the books she used in her American Economic History class. 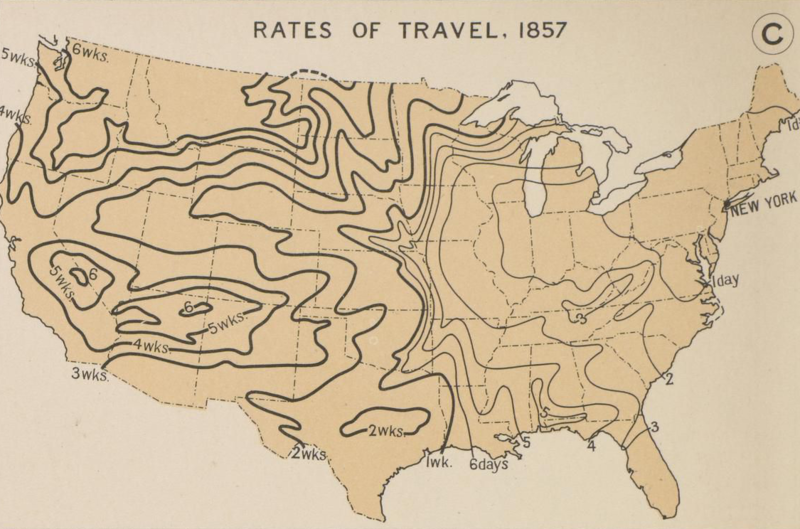 The maps showed rates of travel from New York city to the rest of the country for a series of time periods – 1800, 1830, and 1857. 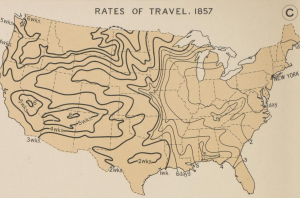 Prof. Knoedler found the illustrations extremely helpful to students in explaining the connections between modes of transport, rates of transportation and the growth of regional economies in the early history of the United States. 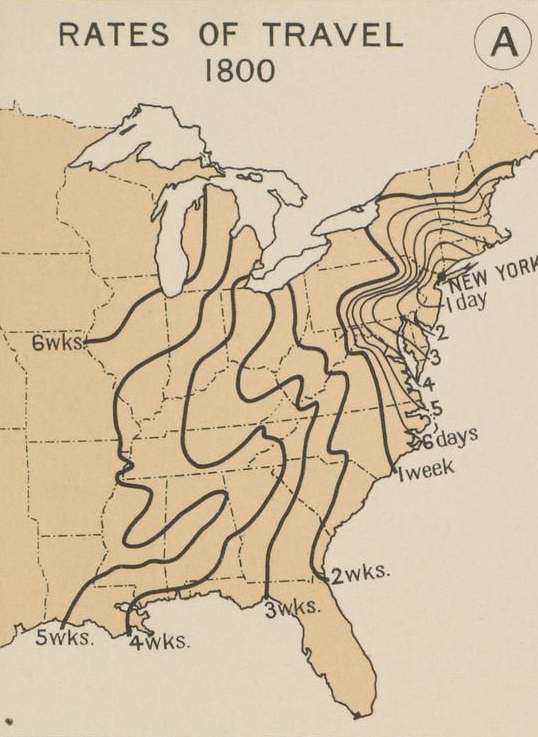 She wanted to know whether we might be able to make more extensive use of historic maps in the class to provide students with a richer geographic perspective and context for understanding why our nation’s economy developed the way it did from 1790-1960. This discussion launched a collaboration between Knoedler and Glathar, which grew over the following two years to include Librarian Carrie Pirmann, and a team of research students. In Spring 2015, Prof. Knoedler received a Mellon Microgrant, which provided money for a student researcher – Amber McDonnell (Theatre/Economics ’17) to join the project. The Mellon Microgrant program provides a small amount of seed money for faculty to develop ideas for teaching or research and is especially helpful for faculty planning for summer and/or trying to maintain momentum during the academic year. The microgrant provides funding for a student researcher to work roughly 5 hours per week during the academic year and is typically rolled as a series of bi-weekly group meetings (faculty + DPS liaison + student researcher) and work sessions (usually between the DPS liaison and student researcher). Knoedler’s primary goal for the spring semester was to identify potential lab topics and explore potential data sources. 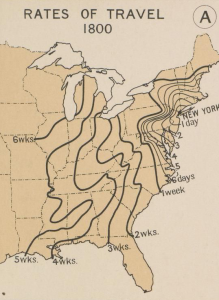 Carrie Pirmann, Bucknell’s Social Sciences Librarian, was added to the project team to provide research assistance and subject matter expertise related to historical Census data. 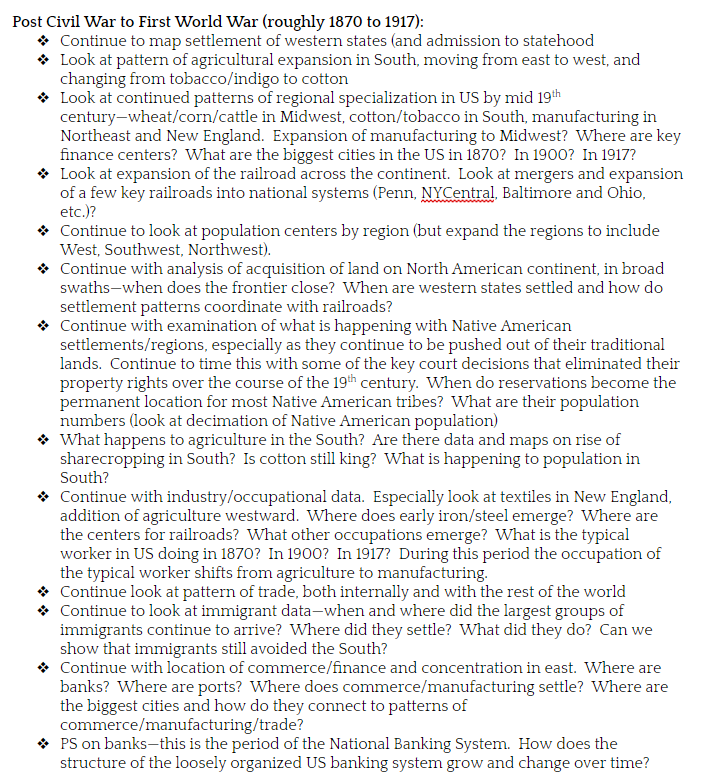 By the end of the spring 2015 semester, a draft plan for the course integration was in place: create 5 ArcGIS Online lab modules (Introduction to ArcGIS Online, Transportation, Immigration/Labor and Great Depression) and have students work in small groups to answer the questions in the lab prompt and then present their group’s ‘response’ to the lab prompt from the perspective of their group’s assigned region (North, South, Midwest or West). In the summer of 2015, Prof. Knoedler received a Mellon Course Integration Grant to put the plan into action. Knowing that creating the lab modules would require a massive amount of data development and visualization, DPS awarded a research grant for an undergraduate student, Amber McDonnell (Theatre/Economics, ’17), to work collaboratively with Knoedler, Glathar and Pirmann on data development, documentation and mapping for the project. Prof. Knoedler developed a series of research questions for each lab topic. 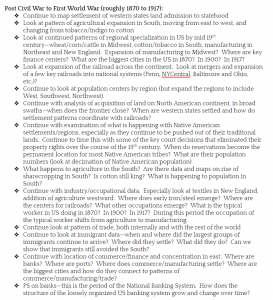 These questions served as the basis for the lab assignments written later in the summer, and served as the starting point for decisions about the data and map layers we’d need to create for the labs. 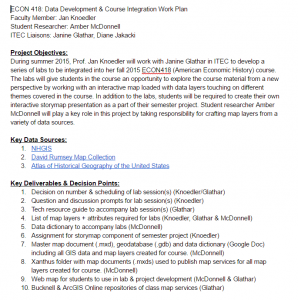 McDonnell’s main focus in summer 2015 was identifying data variables from the National Historical GIS website that would be useful to students in addressing the research questions Prof. Knoedler planned for each lab. 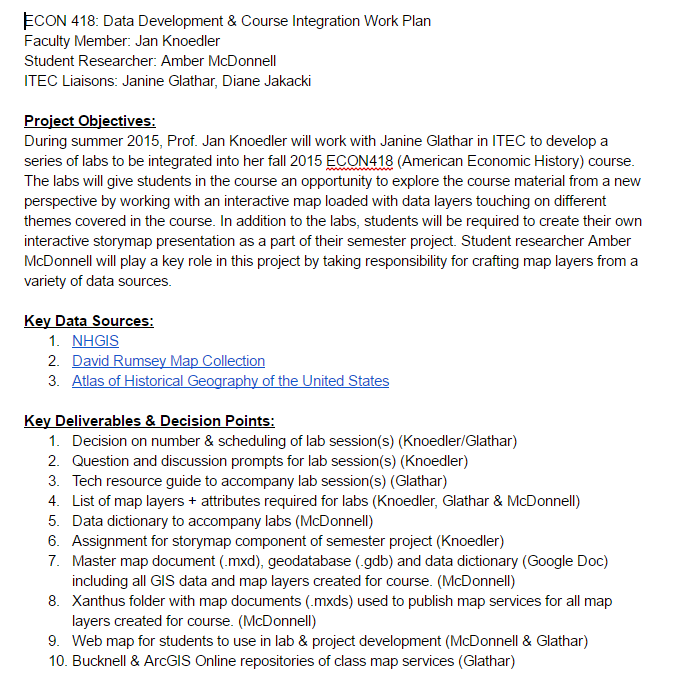 Knoedler & McDonnell received another Mellon Microgrant for fall 2015 to work with Glathar & Pirmann on creating final versions of the ArcGIS Online maps, lab assignments and data dictionary for the course. The revised course has been offered twice so far – Spring 2016 and Fall 2016 – and will be offered again in Fall 2017. Knowing that McDonnell would graduate in spring 2017, Prof. Knoedler brought two additional students – Autumn Patterson (Economics & Mathematics ’19) and Emily Tevebaugh (Economics & Mathematics ’19) – into the project. Since joining the project, Patterson and Tevebaugh, who are funded through the Presidential Fellow program, have created new map layers for the labs and done extensive work on revising the data documentation to make it easier for students to use. Prior to this research/course integration, Prof. Knoedler had taken a Mellon-funded GIS workshop in 2012 and worked with GIS Specialist on assignment for ECON258 using web-based visualizations of income inequality. 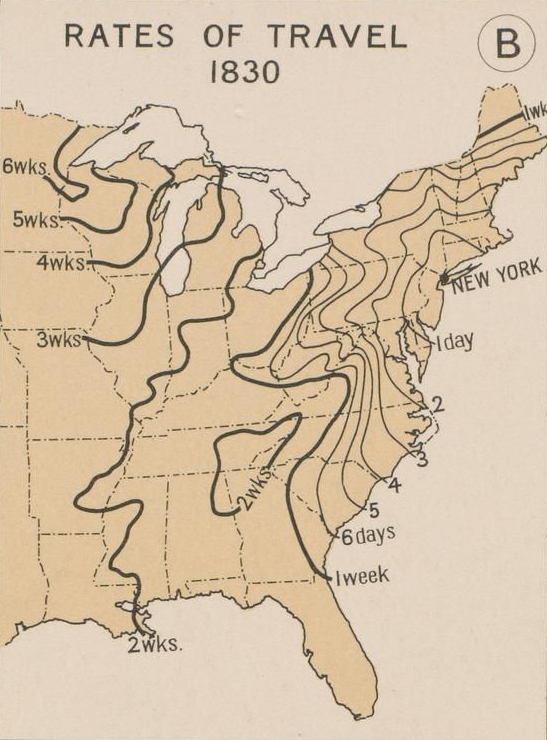 None of the student researchers had prior GIS experience. Feedback from the student researchers as well as students enrolled in the course has been very positive.